- Before departing Hyrule Castle, check the east and west wings via the top floor. Through the eastern door and out on the ramparts you'll find a chest containing 50 rupees. - If you check the Blacksmith's Shop, you'll learn that your buddy Gulley is missing. And... hmm, talk of monsters... fortunately, he's safe in a clearing just south of the Blacksmith's House, accessible by looping near Link's House. Still, keep his position in mind. 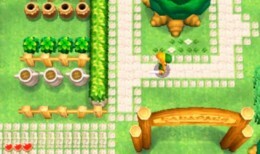 - Check out the area south of Link's House. Travel south through the marshland until you reach the, uh, 'bottom' of Hyrule. Wander east a ways, to the southern shore of Lake Hylia, to find a cave. Inside you can light two torches to unveil a chest containing 50 rupees. Sweet. - Watch out if you keep walking along the lakeshore to the east. The enemies get a bit tougher - don't try and hit those sparking green blobs - and if you try to collect the five rupees just east of the cave, some gobbling fiend will pop up and try to steal your rupees. Beware! - If you head west instead, you'll wind up in a canyon-esque area. Around here is a cave with a Great Fairy who will heal any wounds you've sustained. - We'll start in the south. First up is the Milk Bar, to the left of the entrance. The owner will sell you Milk for 20 rupees. You can store Milk in Bottles and drink it for a quick pick-me-up. (You'll have a Bottle soon, don't worry.) You can also pay the Bard in here to play a song for you. - West of the Milk Bar is a shed. Not much to be said here, though if you pester the cuccos with sword whacks you'll be treated to most vicious reprisal in short order. MUCH shorter order than the other games. - North of the shed is a field with an old man. 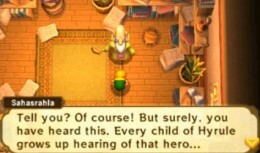 He'll help you set up Streetpass battles, which consist of one-on-one duels with other Zelda players. He'll also plant an apple tree by your house. Ooo, apples. - There's a locked house to the right of the old man. Hm. Just north of it is a weather vane where you can save. - Beside this house is the home of the Bee Guy. Come back here with a Bottle and he'll give you a Net. Use it to catch bees in the wild (you'll need an empty Bottle to transport them) and he'll give you 50 rupees apiece. - Next to the Bee Guy's home is the Fortune's Choice game. For 50 rupees you can open one of two chests. It will either contain 100 rupees... or one. Basically a coin toss, and not one that's worth the bother. - North of the locked house is a Street Merchant. He'll sell you a Bottle for 100 rupees and a heart for 10 rupees, in case you need a pick-me-up. - Beside the Street Merchant is the Item Shop. Scoot Fruits are 50 rupees, and will teleport you to a dungeon's entrance; Foul Fruit is 30 rupees, and will stun nearby enemies when used; a Shield is 50 rupees, and will defend you from basic attacks. The Shield is the only worthwhile buy at the moment. - In the northwest of the village is a well blocked by. Though I don't THINK you're supposed to do it this way, you can grab a cucco and flutter off of the ledge beside the well and get inside. Below are some snakes to kill and a Heart Piece, as well as 20 rupees. Take THAT, intended routes! - Beside the Elder's House in the north is a small jail cell. Not much to see here. Aaaand the elder's house! Watch the cut scene with Sahasrahla. You'll soon receive your new quest: a trip to the Eastern Palace. Sounds peachy, old timer. Slam into the tree beside the Cucco Ranch. A Maiamai will fly out. There's also a Maiamai on the east side of Kakariko Village, in the north. Look for a pair of bushes penned in by fences. Slash 'em up. Check out Rupee Rush after unlocking the Maiamai quest to find one on the southern cliff wall. Have a gander at the forest grove. There's a Maiamai sitting atop the trees in the north. Check out the jail cell in Kakariko Village after you can turn into a painting. You can slip by the bars and get at the chest, which contains 100 rupees. Sweet. Merge with the wall of the Blacksmith's House and crawl around to the back. On a cliff behind the house is a Heart Piece. Use the Tornado Rod on the tiles to the left of the Blacksmith's House to find a Maiamai. There's a screen full of trees one map north of the Blacksmith's House. One of these trees (look to the roughly middle tree in the cluster of five in the south) hides a Maiamai. There's a Maiamai stuck to the left side of the Fortune Teller's Tent one screen north of Kakariko. Return to Kakariko with the Power Gloves equipped. Grab a cucco and fly from the ledge in front of the elder's house to the home with the purple roof nearby. Pick up the rock here and you'll find a Maiamai underneath. After you have both the Sand Rod, check the yard behind the cucco shed. There's a small square of sand here. Use the Rod on it to reveal another Maiamai. Upon reaching the Skull Woods in Lorule, you can find a man in a cave to the north who will fork over a Golden Bee in a Bottle for 888 rupees. Take the Golden Bee to the Bee Man and he'll give you the Bee Badge, which prevents bees from stinging you. Not bad. Bring two pieces of Master Ore to the Blacksmith and he'll upgrade the Master Sword, allowing it to deal more damage. Fantastic. 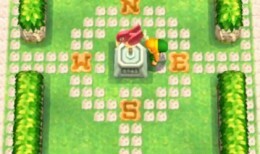 Check behind the rock at the base of the Blacksmith's House to find a Heart Piece. You'll need the Titan Mitts to lift the rock.